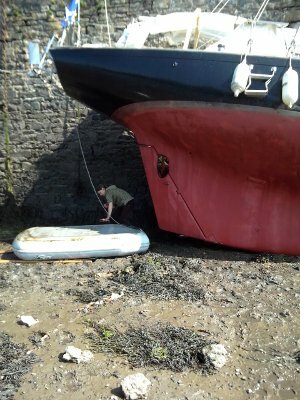 Given the enormous tides of the Bristol Channel, we decided to dry Ara’ Deg out and give her a clean up before heading off on our passage up north. The bottom was pleasantly clean with only a green slime that needed to be scrubbed off – not a big task. Thankfully no mussel beds from the Maritimes were attached. The lack of growth underneath is a testament to the less tenacious sea-life of the higher latitudes. I remember hauling out in Trinidad after spending a month in the Caribbean and a month in west Africa before that. One could hardly see the bottom paint for the encrusted life forms clinging on. After much hard scraping we removed 6 or more 5 gallon buckets completely filled with barnacles – which makes me think there is no bottom paint poisonous enough for those latitudes. This time around a fast scrub did the trick. I decided not to give it yet another coat of bottom paint as giving it a scrub re-activates the old bottom paint and given these high latitudes and lack of voracious sea-life should prove sufficient for the rest of the summer / autumn (or I least I tell myself that saving me £100+ in bottom paint and mess :)). 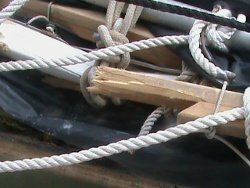 Other improvements include a new main gallows with partial 45 degree sides built from the finest old-growth Yellow Cedar I brought myself from Vancouver Island British Columbia. It needs ‘finishing’ but is currently in use. 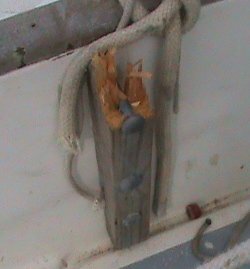 The foremast partner / boot is still causing us some grief allowing a small but irritating amount of water to find itself down into the fore cabin getting the cushions wet. Alison is going to attack it with a sealing gun this afternoon which will hopefully sort it out for good. Or so we tell ourselves ;). 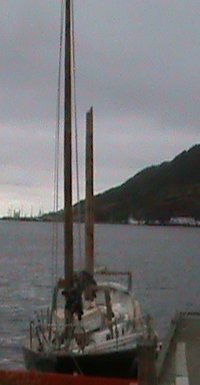 The foresail topping lift has been re-rigged so as to make it running and also pull the cradle forward a little. No more getting the yard snagged on the wrong side of the lifts this time around – I hope. 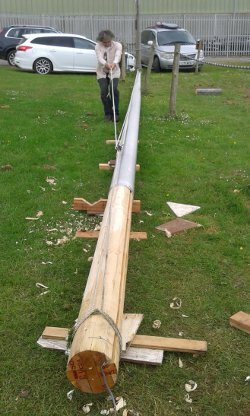 I have also raised the foresail topping lifts and mast-lift a foot so that it can no longer get snagged the bow pulpit which resulted in a broken boom and batten last year when sailing to Ireland in some awful weather. After a 24 hour journey from Lawrenny Pembrokeshire Wales, we decided to take shelter in Dunmore East fishing harbour near Waterford Ireland. Northerly winds and uncomfortable lumpy seas in St George’s channel convinced us it would be better to wait a spell in southern Ireland before catching southerlies to Scotland tomorrow. 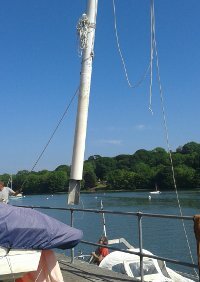 So far her new mast is working as it should. 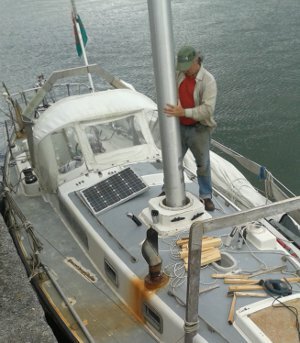 The boat is not as tender as I had feared it would be and it handled 15+ knot headwinds without excessive heel – around 8 to 12%. It will be interesting to see how much it rolls when sailing downwind to Scotland over the next couple of days. Alison asks me how it compares to the previous mainmast and I honestly can’t recall much difference. 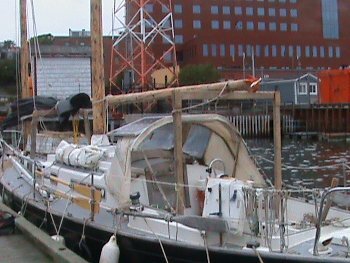 When I was sailing up the Avalon peninsula to St. John’s Newfoundland last year I recall the boat suffering (or me suffering) excessive roll when sailing downwind under foresail only and that it calmed down considerably when hoisting and employing the main. 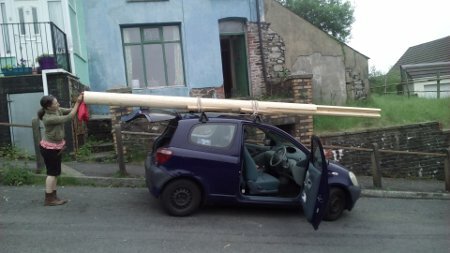 The next few days are calling for 10 to 20 knot southerlies and it will be a good chance to test out the downwind sailing abilities of the new rig as well as scoot up to the west coast of Scotland in good time. 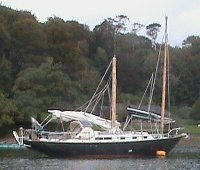 Although I will try different combinations I suspect that sailing under mainsail only may be the best approach for simplicity and carefree sailing. 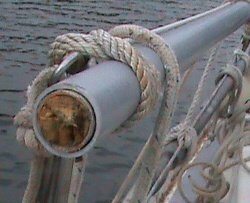 I have tried goose-winging but given the shadowing effect of the mainsail along with the often fish-tailing effect when surfing down overtaking waves, the foresail would often become blanketed and become unstable experiencing random gibes. Still working towards that Junk-rig ideal of a completely carefree sailing experience where one never has to leave the cockpit to sort something out – like snagged lines, etc. Getting closer to that ideal all the time. 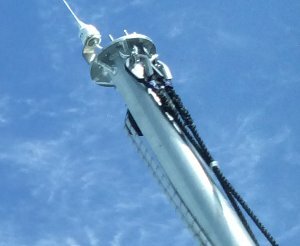 But the real question is, given the increased mass of the mainmast, will the downwind roll factor be increased or decreased. Theoretically, given the increased inertia against rolling that weight aloft should bring, the downwind roll should be dampened, not increased. But then there’s theory and reality – not always compatible. I’ll report my finding next time I catch an Internet connection in Scotland. 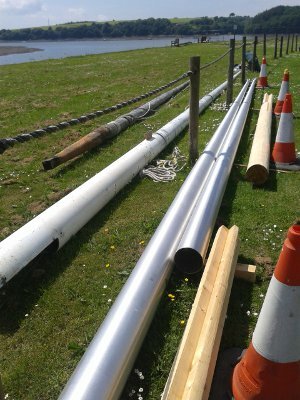 Spent yesterday sorting out the tangled mess of running rigging, main sail and broken mast top. 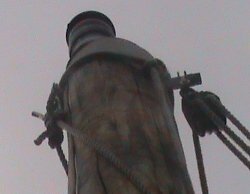 Amazingly, the only thing that suffered damage (apart from the main mast itself) was the navigation lights that was bolted to the top of the mast (and I might be able to fix that). 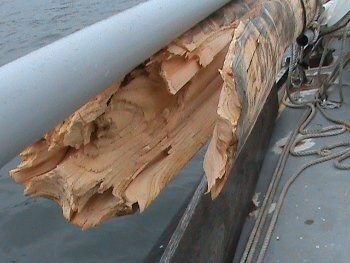 There are no obvious signs of defect in the breakage – other than the fact that it broke where a series of knots were situated – making it a weaker spot from a structural point of view but not fatal – or one would think. The break occurred 20.5 feet from the top, leaving a 14.5 foot stump from the partners up. Add another 8 foot of bury and you have a break close to the center of the timber. At the break the diameter was 7 inches (18 cm). I’m now looking for a secure place to tie up for the winter. 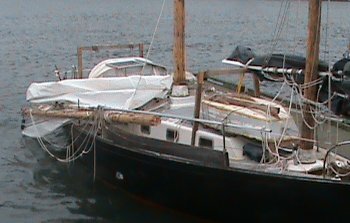 I’ve heard that Quidi Vidi has a small secure cove where I might be able to negotiate a spot. It’s only a half an hour (that’s .5 hour for the metric minded) from here so I’ll go check it out this afternoon. 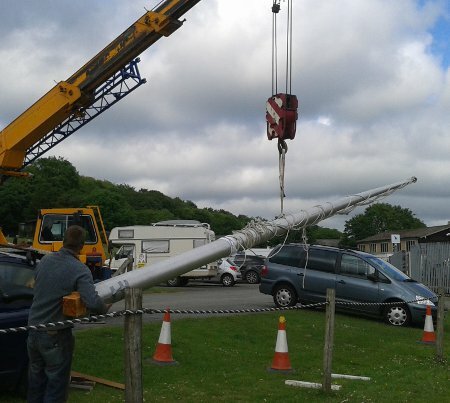 I will then start sourcing a suitable replacement mast. 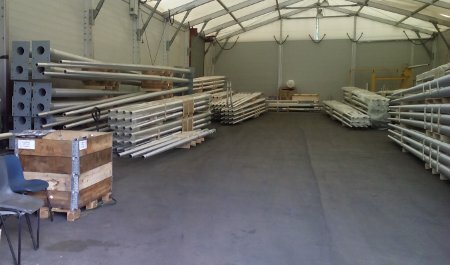 Steel or fibreglass tubes seem the best option. St John’s is a major industrial port now, thanks to the offshore oil boom and if I am not able find anything locally I should be able to get something shipped in.